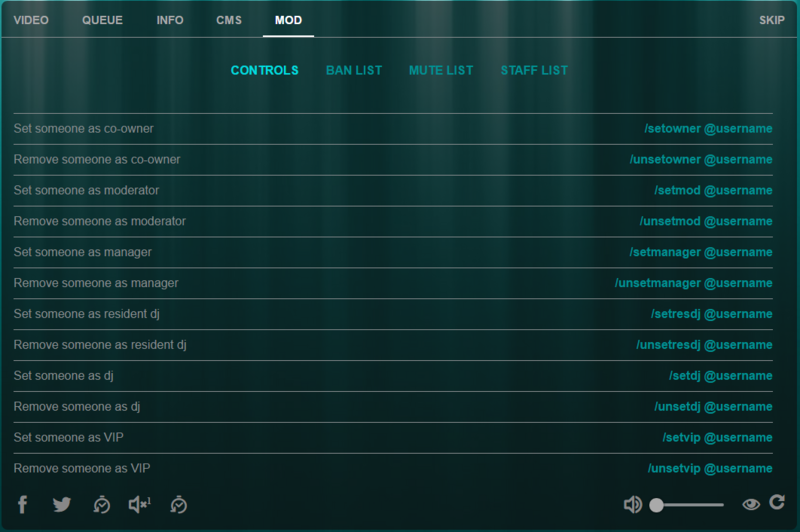 Instead of using typed commands you can also click on a person’s profile picture and see the commands from there. Additional commands for use by room staff and users alike can be found here. 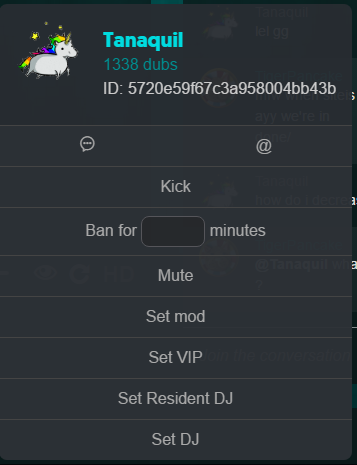 You can mute a user who is causing issue in chat, if the user in question does not merit an all out ban. Muting a user does not tell them they are muted. On their screen, they are still inputting chat. Only the muting moderator can see that the target user has been muted, no one else in the room is notified. This means the muted user can have a jolly good rant to himself and get it all off his chest without annoying other people. You can delete inappropriate chat or images by clicking the ‘x’ in the chat box. Managers and above can permanently ban users, moderators can ban or mute for up to one hour. To permanently ban a user, you must do it from their profile and leave the amount of minutes blank. You can skip songs for a variety of reasons. 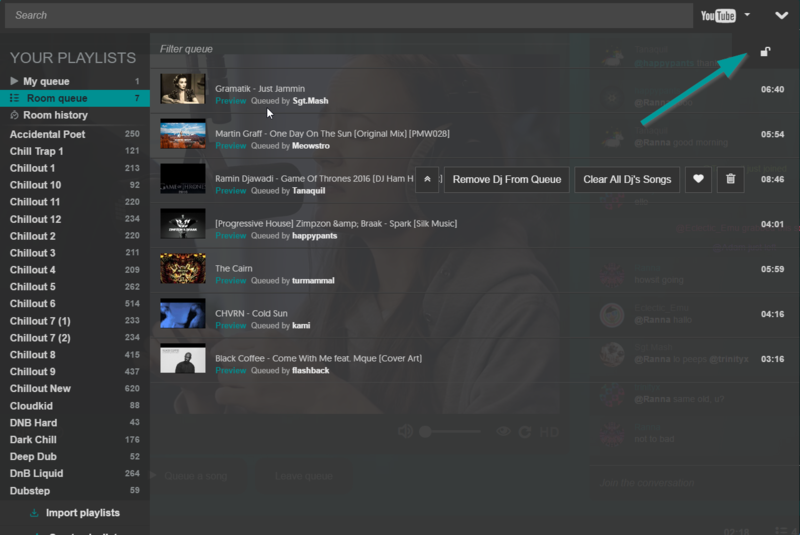 Unpop – The song has been down voted by more than 10% of the total room population. Troll – The song is obviously intended only to cause upset in the room. Use this with caution because it will also permanently ban the named user. A Creator/Co-Host must have enabled the correct song length in room settings when mixes are to be played. To lock the queue during an event, open your queue and click the padlock icon. After this only Staff/VIP’s/RDJ’s can enter the room queue. If it is a mix to be played it is OK to just lock the queue and move the event DJ to the top of the queue. If multiple tracks are to be played it is advisable to lock the queue and clear it entirely, leaving only the event DJ in the queue. Ensure the event DJ understands that the track must not be private on YouTube or Soundcloud when they play it. During an event, for ease, ask the artist to create a playlist of all the tracks he/she wishes to play and queue the whole list. You can manually move people in the queue by opening room queue and using the arrows next to their queued track. Dubtrack importer: https://dubtrack-playlist.appspot.com Works with existing .json files and with the above exporter. https://github.com/dubtrack/www-dubtrack-fm/issues/3 Check the comments from ‘djaybe’ if you are wanting to use existing .json made in pye.sq10.